DOLE, Robert Joseph (b.1923) is a retired politician and attorney who represented Kansas in Congress from 1961 to 1996 and served as the Republican Leader of the United States Senate from 1985 until 1996. He was the Republican presidential nominee in the 1996 presidential election and the party's vice presidential nominee in the 1976 presidential election. HEINZ III, Henry John (1938-1991) was an American businessman and politician from Pennsylvania. A Republican, Heinz served in the United States House of Representatives from 1971 to 1977, and in the United States Senate from 1977 until he was killed in a plane crash in Lower Merion Township, Pennsylvania, in 1991. 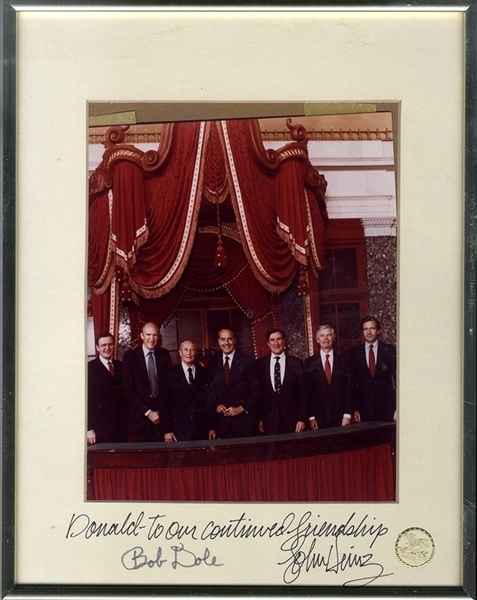 Signed Photograph “Bob Dole” and “John Heinz” beneath inscription by Heinz. 8”x10” matted. Fine condition.